Making Earth observation data freely accessible and usable. That is still our main goal with Terrascope, the online platform for user-friendly visualization, processing and distribution of satellite data and derived information products. Why? Because satellite data have an enormous potential for various applications. We already have remote sensing services to increase crop yields, detect solar potential, improve water quality monitoring, assist humanitarian response and so much more. Now, almost one year after we’ve had our first brainstorm on how the Belgian collaborative ground segment should be developed we can say the first teething troubles have been resolved and it’s time to hit the road. Let me not only explain but also show you what is possible and how to use the massive amounts of EO data so you can get the insights you need. For us it’s obvious that satellite data have a lot to offer. And although more and more people are starting to use remote sensing technology, a lot of people are still just unaware of the value of the data. Terrascope project manager Jurgen Everaerts says it fair and square: “We want to bring Terrascope to every household. Terrascope is not just valuable for the experienced R&D professional. It’s valuable for every citizen, because it shows the bigger picture of how the earth evolves” Under the hood, the detailed and high-quality data of the Sentinel satellites are processed to produce images and products that can be used by everyone. Besides the data, Terrascope also offers services such as Web Services, Notebooks and Terraviewer. So let’s get started. I’ll give you some information and examples on how to use Terrascope’s EO browser Terraviewer. 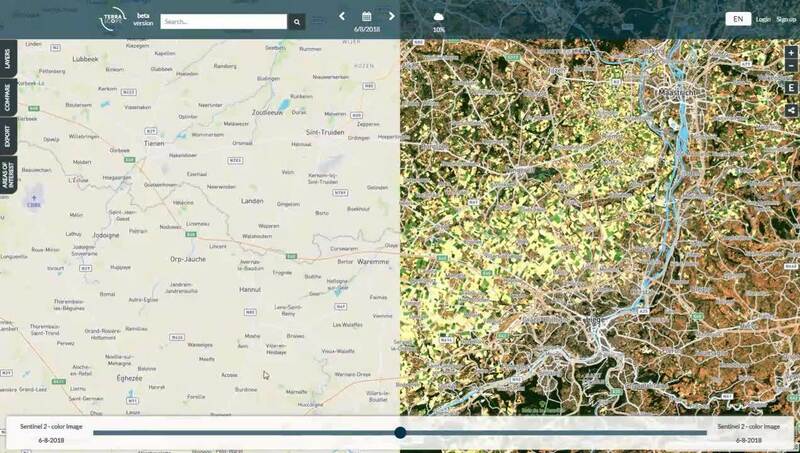 The platform enables you to easily browse, view and download Sentinel-2 data over Belgian territory. The data is available from mid-2015 onwards, and every location is imaged every 5 days. FAPAR shows the photosynthetic activity of green vegetation and is often used as a drought indicator. The main value of Earth observation data of course lies behind the data and the services that can be developed by using or even combining various types of data. Let me give you some examples. We all recall the persistent drought we’ve faced the past summer months. With Terraviewer you can clearly see the substantial impact on arable land after a persistent drought. Using the compare function you can easily compare natural color images of this and last summer, clearly illustrating how different the vegetation looks. Sometimes you happen to notice strange artefacts, like 3 ‘colored planes’ over the Belgian airspace. In that case you can zoom in, save the image via the 'export' button and share it with your friends or the user community, to get an explanation. You can even find out which football team in Belgium plays on artificial grass. In the normal visual spectrum, an artificial grass, just like any other lawn, will turn green. But compare it with one of the biopars FAPAR, LAI or FCOVER and you'll notice that the green surface is not really 'vegetation'. For people new to using satellite data and remote sensing technology it’s useful to get a short introduction workshop. Or even if you’re an experienced user, but want to receive some interesting tips and tricks, a short demonstration can help you get the most out of your efforts. That’s why we’re hitting the road and are organizing the Terrascope roadshows. The first one is scheduled in Brussels on 23 October and we have a second one in Ghent on 7 December dedicated to HOGent students.